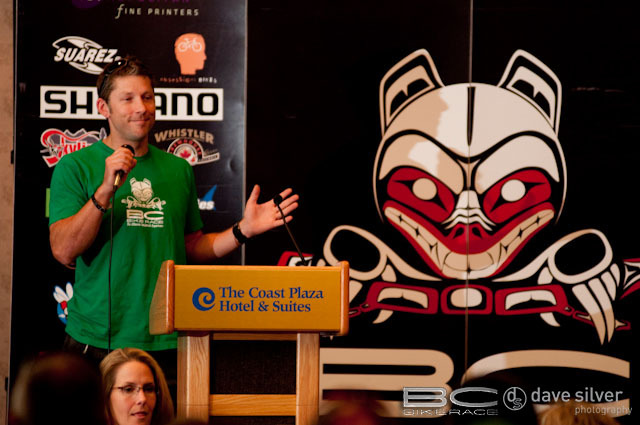 Months of preparation came to a head on Saturday morning as 400 racers converged on the Coast Hotel in downtown Vancouver to check in for the 3rd annual BC Bike Race. With more than 70% of its revised 375 kilometre route comprised of singletrack, the seven-day event event has quickly become one of the most desirable mountain bike stages races in the industry. And if the long line ups at registration this morning were any indication, the attraction of southwestern BC's Ultimate Singletrack Experience is strong, despite the tough economic times. The 2009 starting line up reflects some incredible elite talent that's guaranteed to spin an exciting week of racing. If the 2008 event is any indication, Wicks and Sneddon will have at least two other teams battling with them for the title. Team Trek's Chris Eatough, 6-time 24hr solo world champion, and Jeff Schalk, 2008 US enduro champion, are back for their third year and are gunning for a 2009 title to match their 2007 BCBR win. 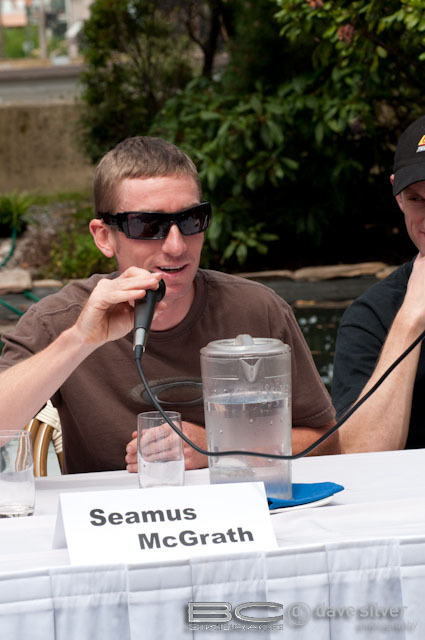 Last year Team Jamis, Canadian Olympian Seamus McGrath and his partner Team Santa Cruz Chris Sheppard, were out of the race before it had barely begun. McGrath suffered a devastating mechanical that left him minus a derailleur and running his bike as a singlespeed. Though their team overall status was DNF, they stayed in the race and claimed 3 stage wins during the week. And now Team Jamis / Santa Cruz is back, and hungry for redemption. The sometimes underrepresented women's field is showing an impressive turnout this year as well, including more than a dozen racers in the new solo category. Over in the team of 2 cat, there should be a hard-fought battle between Canadian Olympian Catherine Pendrell and her partner Katrina Nash 3X Olympian, Reigning US Short Track Champ of Team Luns and Team Maxxis-Rocky Mountain's Canadian mountain bike legend Alison Sydor and Lea Davison. To add to the excitement for 2009, organizers have slipped in a few major race route changes, including a North Vancouver Day 1 start rather than the Vancouver Island kick off of previous years. Though the new start line substantially simplifies pre- and post-race travel and transitions for racers, the real motivator was the legendary North Shore singletrack. Vancouver's North Shore is known for its steep, rooty, rocky terrain, peppered with man-made ladder and bridge features. This fact wasn't lost on racers as nervous energy filled the mandatory briefing room at the mention of North Shore classics like Severed, Bottle Top and Pipeline. Though some might be intimidated by the Day 1 riding, and find themselves walking around some of the trickier sections, it's early times yet. An interesting phenomenon happens at BC Bike Race - as the race week progresses...so do riders' skills. In fact, many racers leave the event much stronger physically and technically than when they arrived. The fortunate few who've already test-ridden Stages 1-3 hint that these new additions could quickly become event favourites...rivalling even the Sunshine Coast's outrageously fun Stage 5, which has unofficially held the “That was the best day of riding, EVER!” title for two years. There's always been a quiet rivalry between BCBR course directors, and it seems that the new guys may have turned up the heat! On Sunday at 10am at the North Vancouver start line marks the first pistol crack of the 2009 BC Bike Race.